"A wonderful fresh and healthy salad alternative to any meal. Especially delicious in the warmer months when fresh local ingredients are in abundance. Trying other versions of this Middle Eastern staple has left me with the knowledge that this particular salad has the right combination of ingredients." Whisk lemon juice, kosher salt, seasoned salt, and chili powder together in a bowl. Slowly drizzle in olive oil while whisking rapidly until dressing is thick and creamy. Pour hot water over bulgur in a bowl; let soak until water is absorbed and bulgur is soft, about 30 minutes. Mix parsley, tomato, green bell pepper, cucumber, green onions, and mint together in a large bowl. Add bulgur; toss to combine. Drizzle dressing over bulgur mixture; toss to coat. Any leftovers should be given a quick stir to mix any accumulated liquid back into salad. I really enjoyed this. Very easy and very good. I added grated carrots and small red, yellow and orange bell peppers instead of the green. I put this with my favorite hummus recipe, some plain greek yogurt and fresh sliced cucs to a toasted pita. So. Tasty. AMAZING! The little bit of mint really brings out the flavour of this dish. 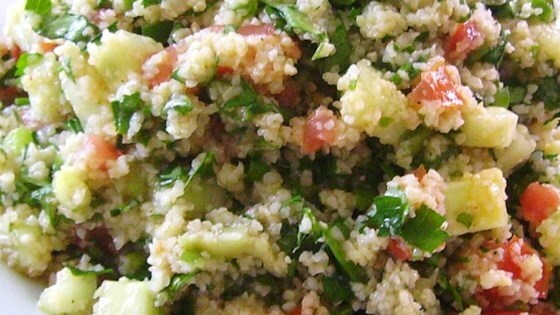 I’m a big fan of tabbouleh, and this is how I will be making it from now on.